Relieves the "itchies" by gently washing away irritants and calming the skin. 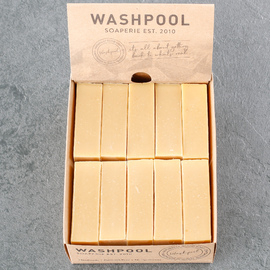 We took the same approach when formulating this bar as we would for any other clients with sensitive skin. 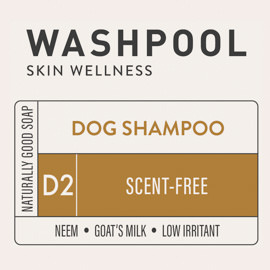 Neem Oil and Goat's Milk combine to help relieve the 'itchies' that can cause so much irritation to your beloved pooch. Olive, coconut, tallow & castor oils help moisturise the skin. Essential oils of Lemongrass, Lavender & Lemon-Scented Eucalyptus provide a pleasing scent. Try rinsing with a few tablespoons of apple cider vinegar in warm water to add shine, balance skin pH and discourage fleas. If you have a helper at wash time it's helpful to cut the bar in half for quicker coverage. 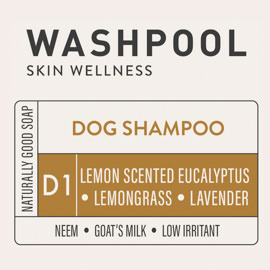 Customers have told us that their dogs enjoy their bath and don't try to remove the smell in the same way they do with other commercial shampoos. We've observed our own litter of 'sensitive skinned' border collie pups happily sit and lick themselves after a bath. 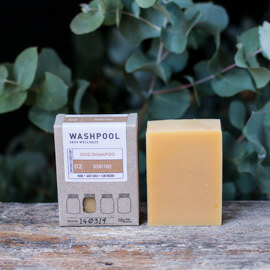 Your dog soap is the ONLY product we have found to stop our little foxie terrier scratching. We thank you and Bronco thanks you (we didn't name him - he would have been Bomber if we had). Would like to say what a blessing it was to discover your dog soap recently. We have a very allergy prone English Staffy, and since using the soap on her, her skin has improved considerably. No more itches or scratching. Her beagle boyfriend next door now uses the same soap for his skin condition. Saponified oils (olive, coconut, tallow, neem, castor), goat's milk, essential oils (lemon scented eucalyptus, peppermint, lemongrass, lavender, rosemary). I have been using the dog soap for a few years now on my dog who has sensitive skin. We tried different medicated shampoos which did nothing. This product works and smells great.